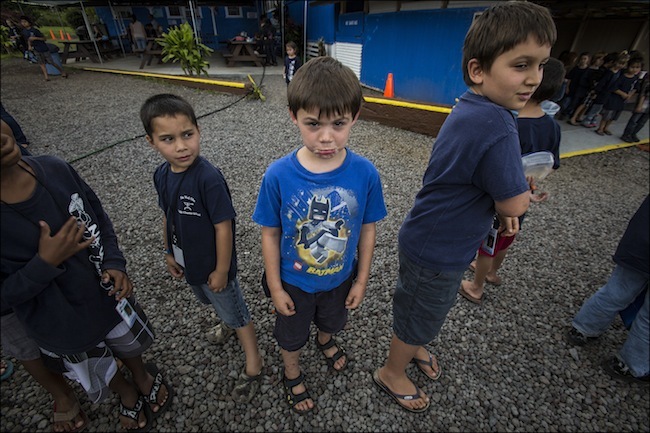 HILO, HAWAII — A 6-year-old boy stands between his classmates in line to gear up for the daily after-school assembly. His brown bangs are crooked and freckles dot his nose and cheeks, which are marked with traces of his last meal. If his blue T-shirt of Batman, the resilient “Caped Crusader,” is any indication, he may want to be a superhero. Na Wai Ola, an elementary school in the Big Island’s impoverished Puna district, was the first charter school Civil Beat visited for its Learning Hilo series, a collection of profiles on four of the nine charter schools in the roughly 50-mile expanse that runs from Hamakua to Volcano.